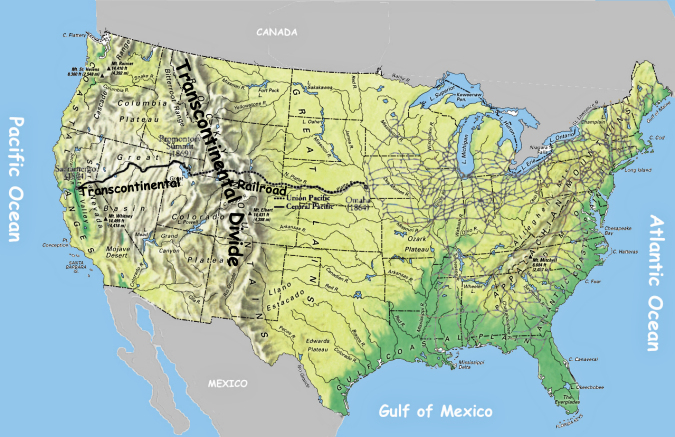 A review of the history of the U.S. reaching the Pacific is not complete without discussing the Transcontinental Railroad. Building the Transcontinental Railroad achieved a goal of creating a fast and easy economic and migrant connection between the two coastlines by crossing the Transcontinental Divide, a physical barrier which in earlier times would have assured the existence of a different country on the west side of the divide. In order to assure a permanent occupation of the area west of the Transcontinental Divide on the map above, during the Civil War President Abraham Lincoln signed the Pacific Railroad Act of 1862 authorizing the creation of two private railroad companies, the Central Pacific in the west and the Union Pacific in the mid-west. The companies were created June 28, 1861, two months after the Civil War began. With the secession of the South, the modernizers in the Republican Party founded in 1854 controlled the US Congress wanted to build the First Transcontinental Railroad. The 1,912-mile continuous railroad line that connected the existing eastern U.S. rail network at Omaha, Nebraska/Council Bluffs, Iowa with the Pacific coast at the Oakland Long Wharf on the San Francisco Bay was completed in 1869. The new line crossing the Transcontinental Divide reached the Pacific and connected in Omaha to railroads serving the Atlantic Seacoast. The implementation of that construction is a symbol of the evolving cultural difference between the Pacific States and the states east of the Transcontinental Divide. The construction could not be done without immigrant workers. On the east side of the Divide to work for the Union Pacific Railroad came immigrant workers from British-occupied Ireland. They came across the Atlantic from Northern Europe, landing in former British colonies. Soon signs would appear saying "No Irish Need Apply" partly because of Catholic religion of the Irish and partly because the British cast a discriminatory shadow over the Irish as non-English speaking natives in a colony. In British eyes, the Ireland and its indigenous population was not significantly differently from their other colonies such as India or Rhodesia (Zimbabwe). Simply, the Irish weren't WASP. As early as 1798 Congress passed laws targeting Irish immigrants. In the 1840's the Know-Nothings, a nationalist political group, was the result of a populist movement of poor whites who were dissatisfied with the two-party system and started their own political party, intent on preserving America’s culture by restricting immigration, especially from Catholic countries. When his party disintegrated over his signing of the Fugitive Slave Act, Whig President Millard Fillmore in 1856 accepted the nomination for President of the Know Nothing (or American) Party, thereby setting a precedent for running as a Know Nothing President. 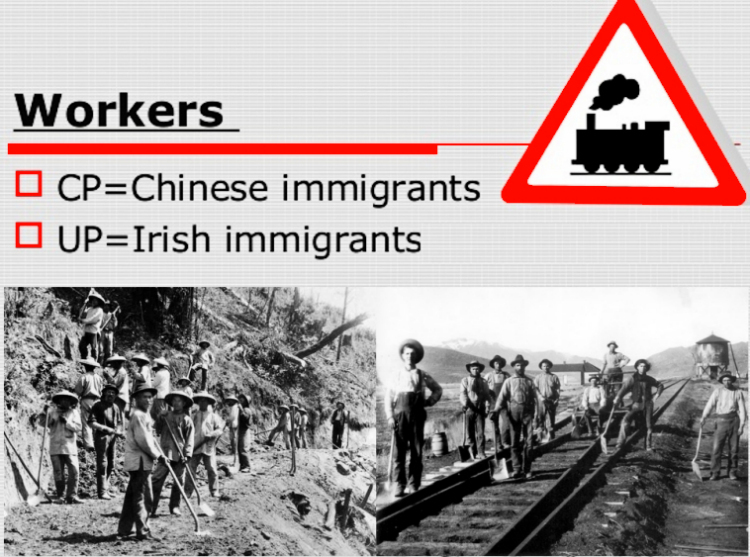 The immigrant workers on the west side of the Divide came from Asia across the Pacific to what was former Catholic-Spanish Mexican territory to work for the Central Pacific Railroad. They were Chinese, of a different race who spoke a language even stranger than Irish Gaelic. Ultimately, in the spring of 1882, the Chinese Exclusion Act was passed by Congress and signed by President Chester A. Arthur. This act provided an absolute 10-year moratorium on Chinese labor immigration. The Chinese Exclusion Act was the first law implemented to prevent a specific ethnic group from immigrating to the United States. It was repealed 61 years later by the Magnuson Act on December 17, 1943. That was after the United States rounded up descendants of immigrants from Japan and put them in concentration camps. The deliberate effort to have Irish and Chinese workers come to the United States was viewed by those living east of the Transcontinental Divide in much the same way as the 49% viewed the 1803 Louisiana Purchase - those workers were a threat like the free black people and the Catholic French and Spanish living in New Orleans. Anything about this sound familiar, similar to today? Why is it a "Pacific" Message?? ?